The benefit of using Google Glass as a headset for making and receiving calls is that you don’t have to fumble for your phone in your pocket and then keep looking down at your phone or holding the phone to your head to converse with someone. Instead, Glass gives you the freedom to make and receive calls hands-free. It’s easy to make a call. Just say “OK Glass, make a call to…” followed by the name of the person in the Glass contact database whom you want to call. 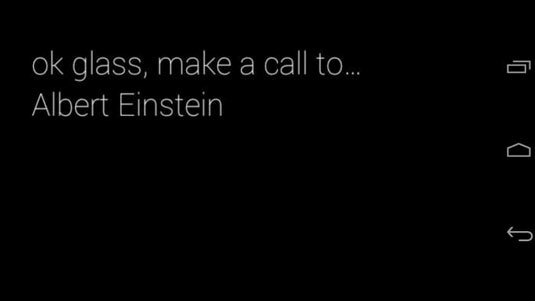 If you say “OK Glass, make a call to Albert Einstein,” you see the call screen shown. Be sure that you have a phone number in the contact record on your Glass for the person you want to call. When you receive a phone call, Glass plays a rising and falling chime on its speaker and then displays the name and phone number of the person who’s calling you. Tap the touchpad and choose Accept from the menu. Tap the touchpad and swipe down. Tap the touchpad, swipe forward, and then choose Reject from the menu. On your Glass, to mute your voice so that the other person can’t hear you, tap the touchpad and choose Mute Your Mic from the menu. You can unmute your voice and be heard again by tapping the touchpad and choosing Unmute from the menu. On your Glass, end the call by tapping the touchpad and then choosing End Call from the menu. On your smartphone, end the call by tapping End onscreen.